We are delighted to announce that Now Interact scooped the Gold Award for ‘Best Innovation in Technology’ and Bronze Awards for ‘Best Application in Technology’ for our work with Tele2 at the 2017 European Contact Centre and Customer Service Awards (ECCCSA). The award recognizes Now Interact’s work with the leading mobile operator to understand its website visitors and deliver a personalized experience to every single one of them. The ECCCSAs are Europe’s largest, and longest-running, awards programme; and over 1100 people attended the celebration in London on Tuesday evening. Having partnered together over four years ago, Now Interact has been working with Tele2 to interpret, understand and react to online behavioral data in real-time to improve its customer experience. Now Interact enables Tele2 to respond to each visitor journey in real-time, delivering the contact channel that is most relevant to each visitor’s needs. For a list of all the category winners, click here. 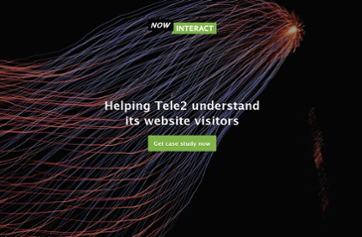 If you are interested in reading the Tele2 case study, click on the image below.